While the scratch-dig specification originates with the U.S. Military’s highly specific MIL-REF-13830B, this has become the standard for United States production of small optics. There’s a series of inspection methods (reticle, scratch-dig paddle, etc. ), but at Swift Glass, we meet them all. 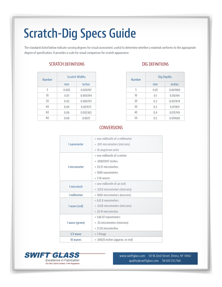 We’ve provided a helpful Scratch-Dig Specifications Guide that indicates varying degrees for visual assessment — useful to determine whether a material conforms to the appropriate degree of specification. The guide also offers a scale for visual — that is, non-quantitative — comparison for scratch appearance. Fill out the form to the right to download this guide for your records today.